In 16 years of creating events for my clients I have never had one that required a thimble until this Monday - August 5th. 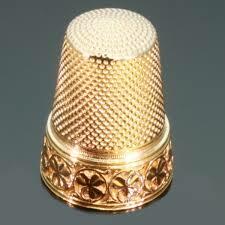 The thimble was integral to the story and had to be present at the ending of the event. Twenty minutes before the event was scheduled to start, I realized I left the thimble home. It was very unlikely a thimble could be found in time. What followed was a bit of panic and anxiety during which the situation was resolved and thimbles were found in one of the shops at the theme park. It was nothing short of a miracle to find not only a thimble but one that was perfect for the event. A little later I was telling a friend how grateful I was to find a thimble quickly and have the crisis averted. At that moment I realized the deeper meaning behind the experience. A thimble is a sign of a seamstress. My mother was a seamstress. August 5th would have been her 73rd birthday. Finding a choice of thimbles available in the theme park just when I needed one - on my mother's birthday - when I have never needed a thimble for an event in 16 years, was in interesting sign to me. My mom is still finding ways to help me when I am struggling. What a gift I received on HER birthday. Thanks Mom. Love you and miss you always. a fairy tale story at the parks. Hi Jane! That is a really sweet story. yep..i see that as a sure sign. perfect symbol. I can't have sweet foods but I can have a sweet life!